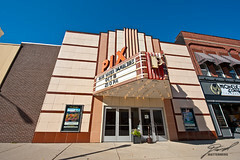 Last year we went walking through downtown Lapeer and found the PIX theater. The cool old place warranted some photos but even with the 18-35mm I wasn't able to get the full building. So as we were in the area again I pulled out the 14-24mm to try some more shots. This is the result uncorrected. It's a little weird, but I like it.